Through planning and packing for a group beach holiday, Gale was both large-and-in-charge and a nelly nervous wreck. Even in the overstuffed minivan, out of the driveway and on the interstate, she remained anxiously edgy until our gang was far enough away to make it completely idiotic to turn back. However, like the eye of a storm, the calm was only temporary as the excitement of arriving and unpacking led her to explode when she discovered an item had been left behind. Time for our tactical maneuvers: fire up the ice-filled cocktail blender to counteract her verbal tirade; pour a chilled one for her as a booby trap; then escape to the safety of the surf. Getaways are intended to be good for our spirits. We all need time away from work, demands, relations, to-do lists, pressures, bad news, and you-name-it, yet sometimes we take those issues, even the folks attached to them, along with us. Even if we love every part of our daily lives, we still need to relax and recharge to bring a new perspective and life-affirming peace. Take your writing with you when you go. It can serve as both a vent to release frustrations and a path to inner calm. Settle your external turmoil by exchanging your hurricane-force whirlwind for writing’s gentle breezes. Allow yourself to listen compassionately to those internal blurts that attempt to sabotage your happy writing, and let them go as you focus your practice on the comforting messages wafting to shore. Just as ideal destinations change according to season and mood, so can what you choose to write. Splashing in a fictional stream of consciousness, playing with prompts discovered in your new surroundings, or strolling the sands of your mind’s thought waves can all be centering and energizing. That’s what I realized as I wrote under an umbrella during mid-week wearing the only bathing suit I’d worn of the four I brought. As the gulls squawked overhead, I wrote about how lugging a suitcase of clothing and three pairs of shoes beyond my flip flops was silly. I also wrote about how much fun Gale could be, but only in small doses, and that another week-long trip with her wasn’t in my best interest. Retreat, I wrote, isn’t about fleeing the enemy, but surrounding myself with positive energy and empowering habits. Like frolicking in the breakers, beachcombing for treasures, and playing with good friends, I am centered, renewed and delighted through writing, a reliable retreat wherever I am. 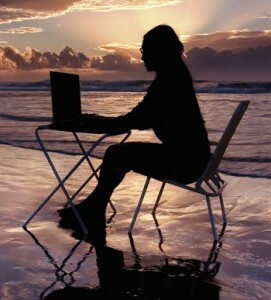 Affirm: At home or away, my writing is always a good journey, an easy-to-get-to destination that renews my spirit. Ah yes I fondly remember all our trips to the beach and the lovely and delicious ice filled cocktail that you made! Some good memories! Thanks for commenting!